(a) As the rain drop is flling with a constant speed, its accleration, a = 0. Hence net force F= ma = 0. (b) As the cork is floating on water, its weight is balanced by the upthrust due to water. Therefore, the net force on the cork is 0. (c) As the kite is held stationery, in accordance with the first law of motion, the net force on the kite is 0. (d) Force is being applied to overcome the force of friction. But as velocity of the car is constant, its accleleration, a = 0. Hence net force on the car F = ma = 0. (e) As the high speed electron in space is far away from all gravitating objects and free of electric and magnetic fields, the net force on electron is 0. If the pebble is thrown at an angle of 45° with the horizontal direction, it will have both the horizontal and vertical components of velocity. At the highest point, only the vertical component of velocity becomes zero. However, the pebble will have the horizontal component of velocity throughout its motion. This component of velocity produces no effect on the net force acting on the pebble. This forcer acts vertically downwards. This force also acts vertically downwards. (c) When the train is accelerating with 1 m s-2, an additional force F' = ma = 0.1 × 1 = 0.1 N acts on the stone in the horizontal direction. But once the stone is dropped from the train, F' becomes zero and the net force on the stone is F = mg = 0.1 × 10 = 1.0 N, acting vertically downwards. (d) As the stone is lying on the floor of the trin, its acceleration is same as that of the train. ∴ force acting on stone, F = ma = 0.1 × 1 = 0.1 NThis force is along the horizontal direction of motion of the train. Note that in each case, the weight of the stone is being balanced by the normal reaction. T is the tension in the string. 5.5. A constant retarding force of 50 N is applied to a body of mass 20 kg moving initially with a speed of 15 ms–1. How long does the body take to stop? 5.6. A constant force acting on a body of mass 3.0 kg changes its speed from 2.0 m s–1 to 3.5 m s–1 in 25 s. The direction of the motion of the body remains unchanged. What is the magnitude and direction of the force? 5.7. 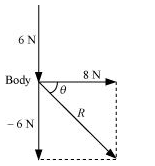 A body of mass 5 kg is acted upon by two perpendicular forces 8 N and 6 N. Give the magnitude and direction of the acceleration of the body. 5.8. The driver of a three-wheeler moving with a speed of 36 km/h sees a child standing in the middle of the road and brings his vehicle to rest in 4.0 s just in time to save the child. What is the average retarding force on the vehicle? The mass of the three-wheeler is 400 kg and the mass of the driver is 65 kg. 5.9. A rocket with a lift-off mass 20,000 kg is blasted upwards with an initial acceleration of 5.0 m s–2. Calculate the initial thrust (force) of the blast. 5.10. A body of mass 0.40 kg moving initially with a constant speed of 10 m s–1 to the north is subject to a constant force of 8.0 N directed towards the south for 30 s. Take the instant the force is applied to be t = 0, the position of the body at that time to be x = 0, and predict its position at t = –5 s, 25 s, 100 s.
∴ Total distance, s" = s1 + s2 = -8700 -41300 = -50000 m = -50 km. 5.12. A bob of mass 0.1 kg hung from the ceiling of a room by a string 2 m long is set into oscillation. The speed of the bob at its mean position is 1 m s–1. What is the trajectory of the bob if the string is cut when the bob is (a) at one of its extreme positions, (b) at its mean position. At the extreme position, the velocity of the bob becomes zero. If the string is cut at this moment, then the bob will fall vertically on the ground. At the mean position, the velocity of the bob is 1 m/s. The direction of this velocity is tangential to the arc formed by the oscillating bob. If the bob is cut at the mean position, then it will trace a projectile path having the horizontal component of velocity only. Hence, it will follow a parabolic path. 5.14. Figure 5.16 shows the position-time graph of a particle of mass 4 kg. What is the (a) force on the particle for t < 0, t > 4 s,0 < t < 4 s? (b) impulse at t = 0 and t = 4 s?  (Consider one-dimensional motion only). 5.15. Two bodies of masses 10 kg and 20 kg respectively kept on a smooth, horizontal surface are tied to the ends of a light string. 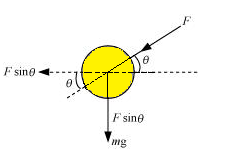 A horizontal force F = 600 N is applied to (i) A, (ii) B along the direction of string. What is the tension in the string in each case? which is different from value of T in case (i). Hence our answer depends on which mass end, the force is applied. 5.16. Two masses 8 kg and 12 kg are connected at the two ends of a light inextensible string that goes over a frictionless pulley. Find the acceleration of the masses, and the tension in the string when the masses are released. 5.17. A nucleus is at rest in the laboratory frame of reference. Show that if it disintegrates into two smaller nuclei the products must move in opposite directions. 5.18. Two billiard balls each of mass 0.05 kg moving in opposite directions with speed 6 m s–1 collide and rebound with the same speed. What is the impulse imparted to each ball due to the other? 5.19. A shell of mass 0.020 kg is fired by a gun of mass 100 kg.  If the muzzle speed of the shell is 80 m s–1, what is the recoil speed of the gun? 5.21. A stone of mass 0.25 kg tied to the end of a string is whirled round in a circle of radius 1.5 m with a speed of 40 rev./min in a horizontal plane. What is the tension in the string? What is the maximum speed with which the stone can be whirled around if the string can withstand a maximum tension of 200 N? (b) This is due to inertia of motion. When a speeding bus stops suddenly, the lower part of a passenger's body, which is in contact with the seat, suddenly comes to rest. However, the upper part tends to remain in motion (as per the first law of motion). As a result, the passenger's upper body is thrown forward in the direction in which the bus was moving. 5.24. 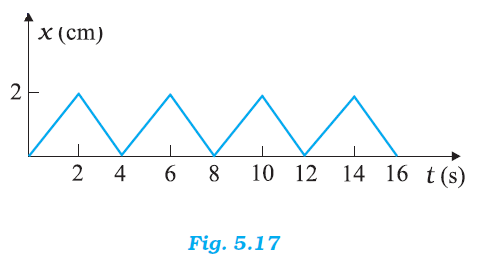 Figure 5.17 shows the position-time graph of a body of mass 0.04 kg. Suggest a suitable physical context for this motion. What is the time between two consecutive impulses received by the body? What is the magnitude of each impulse? The given graph shows that a body changes its direction of motion after every 2 s. Physically, this situation can be visualized as a ball rebounding to and fro between two stationary walls situated between positions x = 0 and x = 2 cm. 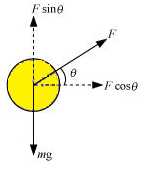 Since the slope of the x-t graph reverses after every 2 s, the ball collides with a wall after every 2 s. Therefore, ball receives an impulse after every 2 s.
(a) The free body diagram of the stone at the lowest point is shown in the following figure. 5.28. A stream of water flowing horizontally with a speed of 15 m s–1 gushes out of a tube of cross-sectional area 10–2 m2, and hits a vertical wall nearby. What is the force exerted on the wall by the impact of water, assuming it does not rebound? 5.30. An aircraft executes a horizontal loop at a speed of 720 km/h with its wings banked at 15°. What is the radius of the loop? 5.31. A train runs along an unbanked circular track of radius 30 m at a speed of 54 km/h. The mass of the train is 106 kg. What provides the centripetal force required for this purpose – The engine or the rails? What is the angle of banking required to prevent wearing out of the rail? Therefore, the angle of banking is about 36.87°. 5.32. 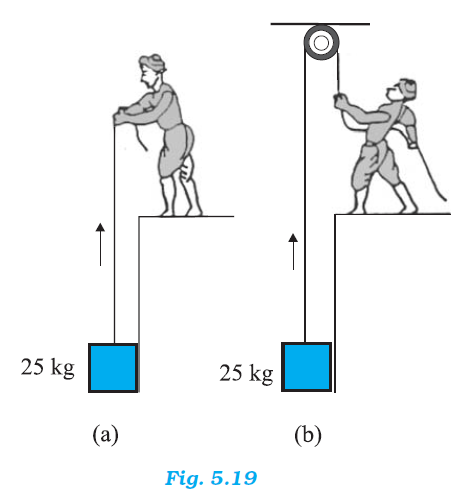 A block of mass 25 kg is raised by a 50 kg man in two different ways as shown in Fig. 5.19. What is the action on the floor by the man in the two cases? 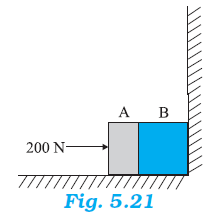 If the floor yields to a normal force of 700 N, which mode should the man adopt to lift the block without the floor yielding? The monkey is climbing with a uniform speed of 5 m/s. Therefore, its acceleration is zero, i.e., a = 0. 5.34. Two bodies A and B of masses 5 kg and 10 kg in contact with each other rest on a table against a rigid wall (Fig. 5.21). The coefficient of friction between the bodies and the table is 0.15. A force of 200 N is applied horizontally to A. What are (a) the reaction of the partition (b) the action-reaction forces between A and B? What happens when the wall is removed? Does the answer to (b) change, when the bodies are in motion? Ignore the difference between μs and μk. 5.35. A block of mass 15 kg is placed on a long trolley. The coefficient of static friction between the block and the trolley is 0.18. The trolley accelerates from rest with 0.5 m s–2 for 20 s and then moves with uniform velocity. 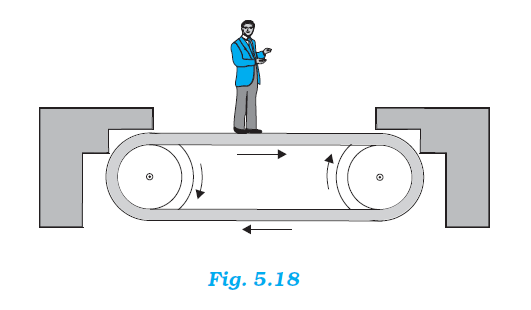 Discuss the motion of the block as viewed by (a) a stationary observer on the ground, (b) an observer moving with the trolley. 5.36. The rear side of a truck is open and a box of 40 kg mass is placed 5 m away from the open end as shown in Fig. 5.22. The coefficient of friction between the box and the surface below it is 0.15. 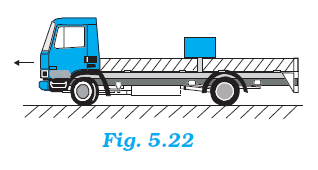 On a straight road, the truck starts from rest and accelerates with 2 m s–2. At what distance from the starting point does the box fall off the truck? (Ignore the size of the box). Hence, the box will fall from the truck after √20 s from start. 5.37. A disc revolves with a speed of 100 / 3 rev / min, and has a radius of 15 cm. Two coins are placed at 4 cm and 14 cm away from the centre of the record. If the co-efficient of friction between the coins and the record is 0.15, which of the coins will revolve with the record? 5.38. You may have seen in a circus a motorcyclist driving in vertical loops inside a ‘death-well’ (a hollow spherical chamber with holes, so the spectators can watch from outside). Explain clearly why the motorcyclist does not drop down when he is at the uppermost point, with no support from below. 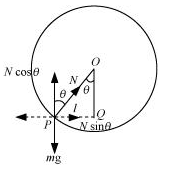 What is the minimum speed required at the uppermost position to perform a vertical loop if the radius of the chamber is 25 m? 5.39. A 70 kg man stands in contact against the inner wall of a hollow cylindrical drum of radius 3 m rotating about its vertical axis with 200 rev/min. The coefficient of friction between the wall and his clothing is 0.15. What is the minimum rotational speed of the cylinder to enable the man to remain stuck to the wall (without falling) when the floor is suddenly removed? 5.40. A thin circular loop of radius R rotates about its vertical diameter with an angular frequency ω. 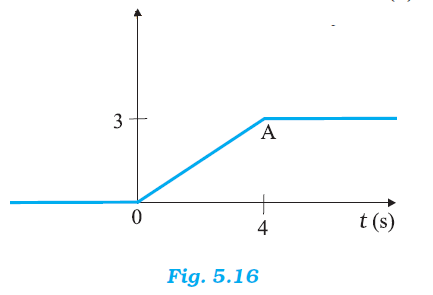 Show that a small bead on the wire loop remains at its lowermost point for ω ≤ √g/R. 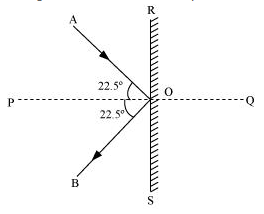 What is the angle made by the radius vector joining the centre to the bead with the vertical downward direction for ω = √2g/R? Neglect friction.